Just another Hidden features and tips and tricks WIKI. After seeing the hidden features of eclipse, java, spring framework I thought we need to have a list of the features, TIPS for IntelliJ too which is the best and the Intelligent IDE available for java. I love syntax-aware selection. Control + W.
When I'm forced to work with other IDEs, that key sequence usually causes files to close. It's a nasty negative feedback loop. Help -> Productivity Guide: See all the fun you've been missing out. Shift-F7 (Smart Step Into) is a useful debugging feature that I haven't seen with other IDE's. I also like CTRL-J to pull up Live Templates, and (unrelated) CTRL-SHIFT-J to merge the next line with this one. I've got a few extra mouse buttons, so I have bound each of these to the buttons for fast access. I love Shift + Control + Space for code completion, it is not a secret thought. You can use it everywhere - in a Spring configuration file, at the right side of an attribution, to complete a method call, to pass a parameter. The nice thing about it is that if you have a parameter of type "X" inside an object "y", when you press Shift + Control + Space twice, it will actually display "y.X" as one of the possible options. I guess I could classify that as a secret :-). Other shortcuts that I use often are Shift + Insert to generate code (such as equals and hashcode, or a constructor to initialize my final variables), Ctrl + I and Ctrl + O to implement/ override methods, Alt + Enter to fix a compilation error/ warning (a code inspection suggestion). I use the above shortcuts very frequently. The one I very frequently see under utilised is Crtl-Alt-F7 (⌘⌥-F7 in OS X), which is show usages. Much faster than "find usages". Both are indispensable for understanding code and how it is used. Another one hidden away is column mode, which allows you to highlight and even replace code vertically. The shortcut for this is Ctrl-Shift-Insert (⌘⇧* in OS X). Don't forget Ctrl+Shift+A, which displays a list of all the keyboard shortcut combinations (just in case you forget any of those listed here). Closure Folding makes Java programming slightly more tolerable after writing Scala. Not the answer you're looking for? 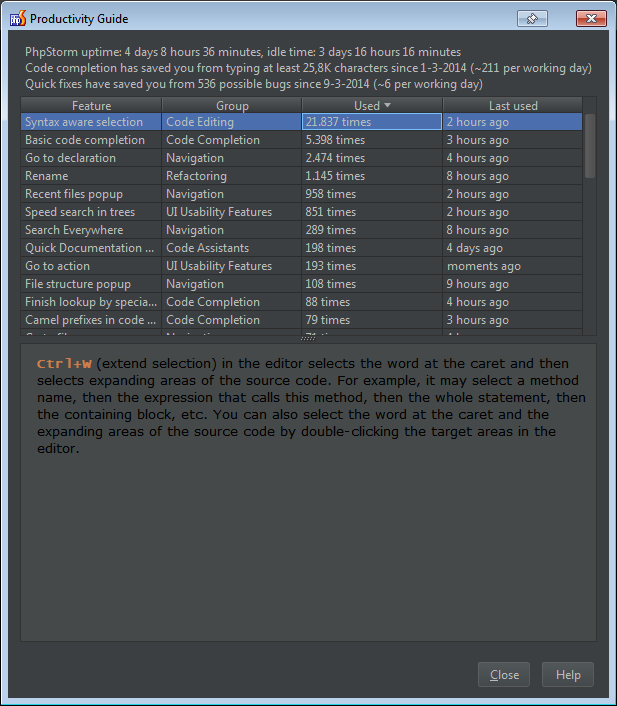 Browse other questions tagged java ide intellij-idea or ask your own question.